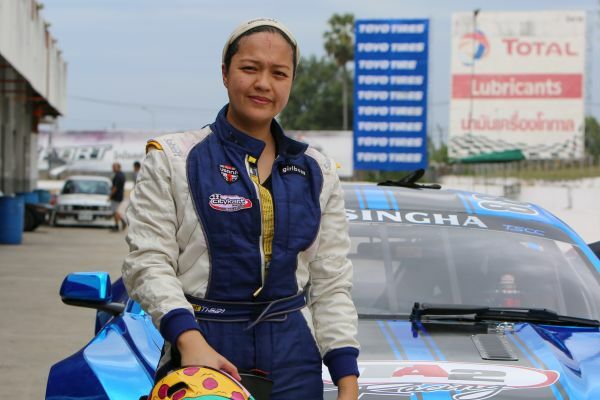 During her day long TA2 test at Bira Circuit, Gabrielle Dela Merced, not just The Philippines leading lady racing driver, but one of the country’s most recognised and successful racers, found time to talk about the test and explain her career. “I started pretty late, I started when I was eighteen but I always wanted to race,” she said, recalling how she first got into motorsport. “I started with slalom, it was like a father-daughter thing.” The top step of the podium habit started early for Gabrielle as she claimed class wins in the Philippines Slalom Championship in 2001 and then emerged as Ladies champion in 2002. That initial promise kicked off the next step as she explained. “Then I went on to circuit racing and that’s when I really realised I wanted to take it seriously,” she said. She started off her step up to the tracks in the production-car based SVI Challenge Cup, finishing third in class in 2003, and then a year later coming home second overall in the final standings as well as bagging third overall in the Philippine BRC Production Touring Car Championship. After a couple of seasons in touring cars she was well prepared to graduate to single seaters and as well as winning the prestigious scholarship for Formula BMW, she also finished third in Formula Toyota Philippines while in 2006 she raced in the Asian F3 Championship. From there, with a big profile at home and a fast growing one abroad, it was a case of out of Asia. “I went to the U.S. and started racing for Spoon Sports where I did the Western Endurance Series championship, they were all races with Honda FDs, 6-hour races, 25-hour races, but then an incident happened with my knees so I went back to the Philippines,” she says. At the same time she was making waves on race tracks across the world, Gabrielle – now more simply known as ‘Gaby’ – had also become a superstar off the tracks in The Philippines, amassing an army of fans impressed by the skills and success of this lady driver. That high profile led her to becoming a recognisable TV host (including presenting her own show ‘Gaby’s Xtraordinary Files’), appearing on the cover of FHM magazine, acting parts in movies and even appearing as a housemate on The Philippines franchise of “Celebrity Big Brother’ TV show. Gabrielle has also appeared in ‘Celebrity Car Wars’ on the ‘History Channel’ where she mentored alongside former Malaysian F1 driver Alex Yoong; a popular TV series that has recently been shown here in Thailand. The powerful Korean ‘S6000’ class is based on a spaceframe ‘stock’ car equipped with a GM 6.2-litre V8 engine with 436 hp and manual gearbox. It means Gabrielle has plenty of experience to call on when it comes to racing big, powerful V8 machines. However, Gabrielle says that while she thought that the S6000 would provide a measure of parity with the new TA2 machines, in fact the TA2 is a much more sophisticated and well developed racecar with very different characteristics. “I was expecting it to be similar, in terms of the engine the S6000 was 435 horsepower, but it drives totally different,” she notes. With an endurance race, just two days before the TA2 test, immediately behind her Gabrielle wasn’t quite sure she would be able to get the max out of the TA2, but she was delighted with the characteristics of the TA2 Mustang she drove. “This car really surprised me,” she said. “I was a bit worried as we just had an 8-hour race so my body isn’t exactly up to shape so I was a bit concerned about not being able to manage the G’s when I got into this car. Like Don Pastor, she wasn’t completely unfamiliar with Bira Circuit having raced here previously, albeit well over a decade ago. “I came here once before for Formula BMW in 2004 and it came back to me in piece,” Gabrielle said. The test, which saw the weather stay hot and dry all day, went very well with Gabrielle happy with the outcome and the TA2 engineers also pleased by the speed to which she adapted to the car and was able to explore its potential. “My whole tactic today was to take it slow, I knew I had the whole day to test the car,” said the 35-year-old. B-Quik races through the rain to win the Championship !